Vitamin SEA serves as the best de-stressing of all time. If you can’t get enough of the sea, maybe it is time to incorporate it into your home. Do not fret, sea-inspired decors are really easy to pull off and create a very uplifting mood. It is also very easy to DIY. The mix of colors like blue, light gray, and white produce a very calming and casual ambiance in your home. We love travelling. We love collecting memories. What better way to remember your boating trips or visits to the shore than with a custom laser cut topographical map? Not into Maps? Try a Wood Topographical Coffee table, or custom clock. Sunlight and creates a very radiant backdrop for your other home décor. The trick is to elegantly drape the window and not conceal it with heavy curtains. Using a natural wood to hang the curtain will give out a very dramatic effect. Make use of the nook in a corner of your house. 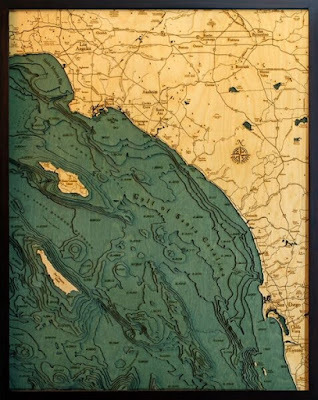 Put in a themed designed board or a wood crafted map to instantly create a sea bound atmosphere. It will be more fun if you put on a map, using pushpins mark the places you’ve been. You can also make flat pins using shells or other mementos from your trip. If however, you have not been on a vacation for some time, use the board to mark where you want to go. The board will also bring inspiration to plan those perfect vacations. Make use of those shell collections. Instead of storing them somewhere in the house try arranging them in artfully and add some candles. It will instantly give you the ocean feeling. If arranging is not your talent you can opt for a more minimalist theme. Put a well-rounded conch in a glass container and pour sand into it. You can let the vase be the center of the attention or rest some starfish or another shell into the vase to complete sea inspired décor. Bring out the natural beauty of the wood by arranging them into sea creatures, boat or anchor. Recycle wood into an artistic masterpiece creates a bold statement in your home. Punch small holes in shells and use a wooden string to tie them together to create an interesting array of sea shells. You can put them over a mirror or use them to bind to tie your curtains. These shells can also make your shower curtains a lot more fun. These nautical coasters made with white ropes gives out the feeling of being on a yacht out in the open seas. Make an interesting centerpiece with these netted mason jars. Choose a jar that already has a hint of blue color fill it with sand and candles to make it more spectacular. You can either put it in the entrance hallway or hang it on by the porch. Transform an ordinary doorway into an attractive corner. Glue in shells and starfish on top of the hangers to set the sea inspired theme in your house.